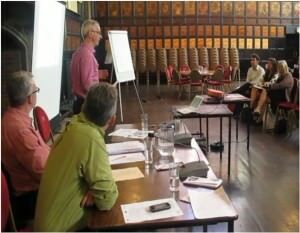 The PB Network hosted its autumn network gathering in the historic North East market town of Durham on 1 October 2013. The venue was the main hall of the newly refurbished Durham Town Hall. We heard presentations on the latest developments in Participatory Budgeting (PB) in the UK, held engaging workshops and debates on mainstreaming PB, met leading experts in the field and thereby supported one of the most interesting and effective innovations in direct democracy. This event was made possible by the support of the University of Westminster Centre for the Study of Democracy, Durham County Council, PB Partners and many others.